After a stellar performance at the 2005 African Championships, Stanley Chumfwa shared his impressions of his performance and his prospects for the future with The Chess Drum. He earned a trip to the FIDE World Cup which will start on December 3rd in Elista, Russia. TCD: First off, congratulations on a fine result. Thousands of chess fans around the world tuned into The Chess Drum to witness your fine performance. Did you make any special preparations for this tournament and how much did playing in your home country help you? I did not do much in terms of preparation. I looked at a few positions from currently popular lines. I would say I was more prepared psychologically. A lot of people where confident that I could do well on home turf and I was not willing to let them down. Apart from the Zambian championships which I participated and won earlier this year I did not have much in terms of tournament praxis. 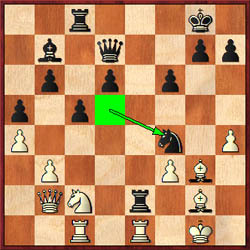 I believe this had a bearing on my overall results as I had problems converting very simple positions particularly against Rizouk and Belkhodja. Though I must admit that the latter was very tricky as the exposed position of my King offered a lot of opportunities to black. TCD: Many times in a tournament, we play a game that motivates us for the rest of the tournament. Which of your games would you say was the most important in this regard? I guess my most inspirational moment was after my win against El-Taher he is one of the most difficult players to beat on the continent of Africa. After this game, I was sure of making it at least to the last five. TCD: You needed at least a draw in the final round for an IM result and possible qualification. What were your thoughts before playing FM Farai Mandizha? My game against FM Farai Mandizha was always going to be a very tricky affair. He is one of the promising players on the continent of Africa. But at this point I just felt I was destined to make my very first appearance at the World Cup. Mandizha is a very aggressive player, so I chose a quiet line and as I had suspected, he played an exchange sacrifice which did not quite work out for him. TCD: Now that you have qualified for the FIDE Cup, you are paired with Etienne Bacrot, a strong French Grandmaster. How are your preparations coming? It is a pity I have limited time to prepare for Bacrot… but you see we do not have a lot of opportunities here in Africa of meeting these top guys. Believe me I am determined to make the most of this opportunity. I will be fighting when I get to Russia. TCD: After the World Cup, do you have plans to play abroad (maybe in the US or Europe)? Chess is a very respected sport in Zambia actually it has received elevation from a minor sport so I am sure we can get sponsors to play abroad. TCD: I'm sure you have gotten a lot of congratulations within Zambia and throughout the world. Has Amon Simutowe helped to provide a source of inspiration for you? In Zambia we all get a lot of inspiration from Amon Simutowe I must say even people who do not play chess are inspired by Amon. It is really nice to share the same platform with Amon in terms of representing the country. 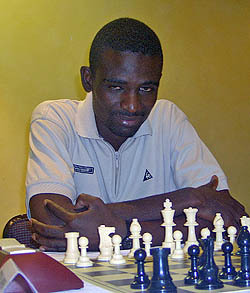 I will always admire Amon who is not only a fellow chessplayer, but a friend I am sure we will hear more from him. TCD: Thank you for taking the time from your preparations to speak with The Chess Drum community. We wish you all the best in the upcoming FIDE World Cup!